0-1-1-1 James Isaac Plymale I was born in Giles County, Virginia sometime between 1804 and 1807. He was raised from infancy by his grandparents instead of his mother. He moved to Gallia County with them about the year 1820. His mother Elizabeth stayed behind and lived with her husband Joseph Rowe. It is unclear who James Isaac's Plymale's father actually was. As an adult, 0-1-1-1 James Isaac Plymale I visited Pike County, Kentucky to see some of the Rowe family that he knew from when he lived in Giles county, Virginia. It is thought that while on this trip he met and fell in love with Mary (Molly) Rowe. 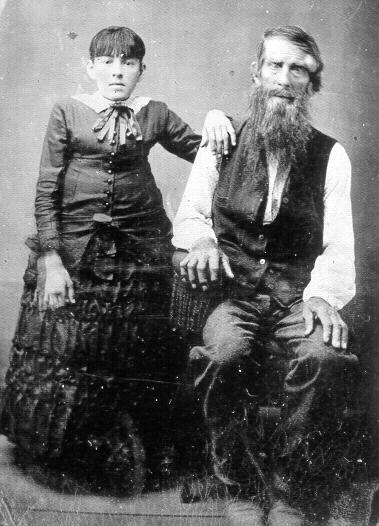 They were married on May 27th, 1830 in Pikeville, Kentucky. James Isaac bought a farm near Pikeville, Kentucky on Russell Fork, a tributary to Livitha Fork of the Big Sandy river. Here on this 700 acre farm, that was also rich in coal, they raised a family of fifteen children. During the Civil War, three of his sons, 0-1-1-1-1 Hugh, 0-1-1-1-8 James II, and 0-1-1-1-9 William, fought with the Union Army. After the war ended, 0-1-1-1 James Isaac and his son 0-1-1-1-1 Hugh had to flee Pike county for their lives as the local people were in sympathy with the Confederacy and were going to kill them for fighting with the Union Army. They rode horseback to Catlettsburg, Kentucky where they settled down. They bought a small farm on the Twin Fork of Catlett's Creek about three miles south of Catlettsburg. 0-1-1-1 James Isaac remained in Catlettsburg until his death in July of 1888. He is buried there in the Warner graveyard. As of the mid 1960's, 0-1-1-1-14-6 James Isaac Fields owned and lived on the little farm where his grandfather 0-1-1-1 James Isaac Plymale spent the last fifteen years of his life. buried in National Cemetery ? 0-1-1-1-9 William H.** about 1847 7-29-1864 in Andersonville Prison, Georgia ? *New information has determined that 0-1-1-1-2 Wirena Plymale was actually not born into this family. She is likely to have been born "Wirena Adkins" sister of Dulcena Adkins and her father was probably Anderson Adkins. **0-1-1-1-6 John Plymale enlisted in the Union Army on Nov 15th, 1861 at Catlettsburg, Kentucky. He was mustered into Company C, 14th Kentucky (Volunteer) Infantry, at Louisa, Kentucky on Dec 10th, 1861. He was described as 5' 8" tall, dark hair, dark complexion, blue eyes, occupation: farmer. He was promoted to Corporal in November 1862. On March 15th, 1864, he was transferred to Company A, 14th Kentucky (Veteran) Regiment. He was discharged September 15th, 1864. He returned home unscathed from the war, only to die in a slate fall in a mine on Catlett's Creek on his second day of work. 0-1-1-1-9 William H. Plymale enlisted in the Union Army with his brother 0-1-1-1-1 Hugh, and was also mustered in on Nov 18th, 1862, and likewise assigned to Company D. At his enlistment he was described as age 18, 5' 7" tall, fair complexion, blue eyes, light hair, occupation: farmer. On August 24th, 1863, while on scouting duty in Eastern Kentucky, 0-1-1-1-9 William H. Plymale and fellow soldier William Sword, were captured by scouts Lieutenant James McFaul and Lieutenant John D. Diamond from a small detachment of the 10th Kentucky Calvary (CSA). They were taken to Castle Thunder Prison in Richmond, Virginia. Later William was transferred to Andersonville Prison in Georgia. On July 29th, 1864, he was admitted to the Prison Hospital where he died of Chronic Diarrhea. His grave is #4220 in the Andersonville National Cemetery. Andersonville Prison authorities notified the Union Forces of his death. When the information was received by his unit, the task of preparing the Casualty & Death Forms fell to his brother 0-1-1-1-1 Hugh Plymale, who notified their parents.